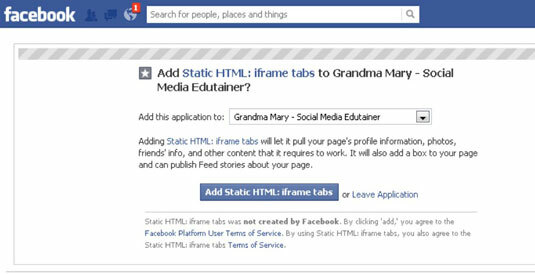 With the Static HTML: iFrame Tabs application, you can create fan-only content on your business page. This application allows you to upload an image directly (if you have a $7-per-month paid plan), or you can use HTML code to reference an image to display. You can have multiple Static HTML tabs on your page for free if you don’t need to have the images hosted. To use this application, go to http://apps.facebook.com/static_html_plus. Alternatively, you can usually find it by searching for the title of the app in the search bar of Facebook; you should see it in the drop-down list of search results. You’ll know that you’ve found the correct app if you see a star icon on the application Page. You must use HTML coding for this app, but the good news is that the app is free. Also, you can have multiple tabs on your Page with this app for free. Click the blue Add Static HTML to a Page button. You’re taken to a screen with a drop-down menu that allows you to choose the Page where you want to add the app. Choose the Page from the Add This Application To drop-down menu. The Add Static HTML: iFrame Tabs button appears. Click the Add Static HTML: iFrame Tabs button. You’re now taken to your Facebook Page. Click the Welcome tab with the star icon below your Cover photo. You see the editor page for the app. 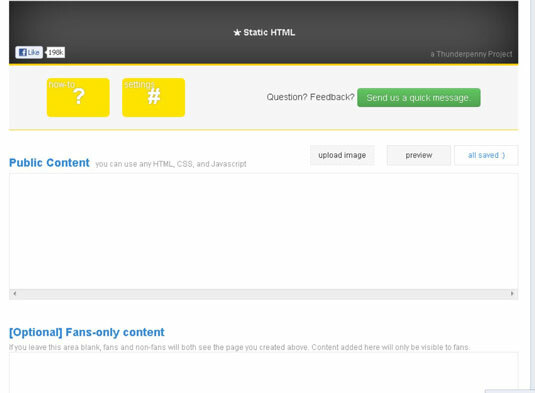 Enter your HTML content and the optional fan-only HTML content. This is where you create fan only content. Click the Preview tab in the top-right corner. You’re taken to another window, where you have to view your tab as a fan, view your tab as a nonfan, or go back to the editor. Click the View Your Tab as a Public and Fans link to make sure that the tab looks right if you are using the Fans-Only content option. This will give you a preview. Click the Edit Tab button to get back into the editor page. You will return to the editor page. Click the Save and Publish button in the top-right corner. You’ve set up your custom tab!